I'd love to share my flute playing skills and music knowledge with you. I was a student of Peter-Lukas Graf at the Basel Music Academy and now with over 30 years of performing and teaching experience behind me, I enjoy solving technical problems and inspiring flautists to find their own voice and to realise their full potential as a flute player . I've played principal flute wth the Zurich Opera Orchestra, Zurich Chamber Orchestra , St Gallen Symphony Orchestra , Sao Paulo Symphony Orchestra, Queensland Symphony Orchestra and Australian Opera and Ballet Orchestra . I perform at chamber music festivals around the world and have received international acclaim for my CD recordings. As a teacher, I focus on beautiful tone production and phrasing, intonation, clear articulation and fluent finger work all through that which is fundamental - a correct breathing technique. I believe that every musical and technical difficulty can be overcome through a good breathing technique in order to master perfect air flow. I use simple language and try not to intellectualise everything, thus making fine flute playing feel as easy as possible ! Soloist's diploma - master's degree in performance . "Superb playing. Bravo. I cannot imagine these pieces played better! " Vladimir Ashkenazy, November 2009. "NSWQ stand their ground against even the Berlin Phil quintet’s recording." Limelight magazine, December 2011. An annual boutique chamber music festival held at the Manly Art Gallery and Museum as part of the Manly Arts Festival . I had a 15 minute* free lesson with Bridget. I am so glad I did. Her instruction was focused, easy to understand and very helpful. She exhibited the perfect combination of encouragement and appropriate criticism. I am very much looking forward to working with her in the future. Bridget Bolliger was my teacher when completing my Bachelor of Music Performance degree at the Sydney Conservatorium of Music. 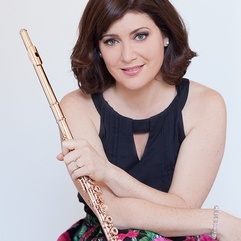 Thanks to her deep knowledge of the flute, music and her generosity of sharing, I was able to win a position with the Australia Opera and Ballet orchestra, travelled the world playing with other notable orchestras in Germany, Sweden, Japan and now the United States where I currently play with the Indianapolis Symphony Orchestra. With Bridget’s guidance, we managed to cover a huge selection of the flute repertoire. This included standard pieces such as the Partita by J.S. Bach and the Mozart Concerti through to contemporary pieces like Scrivo in Vento by Elliott Carter and Chant de Linos by Jolivet among many others. Bridget encouraged me to start taking auditions at a young age and is still a big influence on the way I approach any orchestral audition.